Soft lighting, generic jazz music, cheap wine, flowing beer, canapés, dimsum, finger foods and pretensions—that pretty much describes the stereotypical gallery opening in the “modern” art world of Manila. People laugh, smoke, kiss each other’s cheeks and throw in art words as they toast to the success of the exhibiting artist and gallery. They are the connoisseurs, artists, gallery staff, collectors and critics. They are deemed “experts” in the artistic field—the avant-garde. How can one fully appreciate the avant-garde of Manila’s art? Charles Baudelaire described the perfect audience of modern art—the flâneur, “The crowd is his element, as the air is that of birds and water of fishes. His passion and his profession are to become one flesh with the crowd. For the perfect flâneur, for the passionate spectator, it is an immense joy to set up house in the heart of the multitude, amid the ebb and flow of movement, in the midst of the fugitive and the infinite. To be away from home and yet to feel oneself everywhere at home; to see the world, to be at the centre of the world yet to remain hidden from the world—such are few of the slightest pleasure of those independent, passionate, impartial natures which the tongue can clumsily define. The spectator is a prince who everywhere rejoices in his incognito” (Baudelaire 795). Maybe one does indeed need to embody the French flâneur, in order to bear with the avant-garde. A work regarded as avant-garde is something good, great even. It is the new and chic in the art circle. 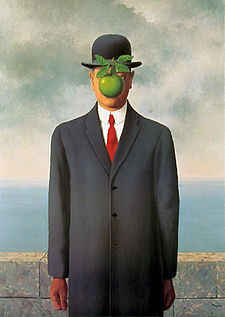 One often hears of this artist or that is really avant-garde and is quite popular and celebrated. These artists are the new and the modern artists. Endless small talk among the popular experts would continue for about three to four hours. If you would actually listen though, among the clinking glasses and swishing beers, you would be left in a wide-eyed wonder at what everyone is actually talking about. Through the eyes of the flâneur, this scenario might’ve been much better. For an idler that could independently wander around through endless parties, belonging yet remaining hidden, perhaps the flâneur would enjoy gallivanting through this crowd. It will not be surprising that such a circle would not have read Clement Greenberg’s Avant-Garde and Kitsch written as early as 1939. He cites the pre-eminence of the avant-garde because of its “superior consciousness of history” and its purity as “art for art’s sake” (Greenberg 2). You can stare and listen for hours, wondering if they are aware of how old the concepts they were talking about are. Given the flâneur’s luxury of time, perhaps a flâneur would’ve read Greenberg and would be able to articulate on the avant-garde much better in this crowd. One would wonder, though, would the flâneur be as aware and as conscious of what modernism really is and where the concept came from? Would the flâneur have the time to read on history and philosophy or would parties and gallery exhibits mostly occupy such luxury of time? Would he encounter the fact that the newness of the modern started out as early as the mid-1500s when the break between the accepted dogmas of the church surfaced upon the scientific findings of the Copernican Theory? That the dogmas were declared wrong and the man is proven correct? This concept would later be refined by Galileo and Kepler in the 1700s. Ecclesiastical authority declined as the man discovered his own authority over the environment. The power of the man is slowly recognized until such time that a man is considered as the creator and discoverer rather than being a subject of a creator. By the time the Renaissance came into being and classical knowledge were re-discovered, religious dogmas were relegated as the myths of the “dark ages” (Russell 491-495). Can the flâneur take some time off from the socialization and go in-depth in the concept of modernism that created the very nature of a flâneur? Thinking about is, would a flâneur go to church? Or perhaps feel how it’s like to be trapped within a belief of one? Emancipation from the church gave rise to the individualism. The role of the individual increased and was freed from the collective as the church followers and followers of god (493). By the time Greenberg wrote his article, the individualization and specialization of the artist is no longer a new concept, but a concept a few hundred of years old (Greenberg 4). Contrary to pretentious belief, the modern individuality of an artist is not an invention of the present but something that has been written about in 1939 and was developed as early as the Renaissance. I then wonder how some artists would feel, declaring themselves as modern artists, if they are made aware of these concepts. Will the flâneur know how old the concept espoused by the nature of his own individual existence? Ironically, though modern thought and philosophy started with breaking away from religious dogmas and doctrines, modernists still went back to these debunked concepts to explain modern art. Greenberg cites the imitation of God in the dissolution of content and the sole focus on the forms (2-3). This type of thought would persist as the form and even colour is viewed as the resonance of the spirit such as in Wassily Kandinsky’s Concerning the Spiritual in Art. Though the break in the philosophical thought was significant, it eventually came into full circle as modernists went back to religiosity, spirituality and godliness in their philosophies. Again, I begin to wonder how the art circle would accept a reading of the avant-garde modern paintings they market into something akin to Kandinsky, that the blue is restful and a heavenly colour and that it has profound meaning in its retreat from the spectator. I also remember a work of Joya in the Ateneo Gallery, a white and yellow painting. In the Kandinsky analysis, the white is the harmony of silence and the absence of colour while the yellow, as typically earthly colour, is a sickly colour that can never have any profound meaning (Kandinsky 27-45). Such thought process is still difficult to reconcile to modern philosophy of breaking away from religious dogmas that has ruled over art production before modernism. Can the flâneur, exposed merely to bourgeois society, understand the irony and implication of spirituality in modern art? The flâneur belongs to society, particularly, the bourgeois society, wherein they drink in and experience the pleasures of art. The more prevalent modernist perspective among the appetizer guzzling, alcohol gulping and social climbing is the experiential aspect of artworks that is a very modern perspective. Modern in the period of modernism, certainly, but looking at their perspective today, it is very different. In 1914, Clive Bell wrote that, “Without sensibility a man can have no aesthetic experience, and, obviously, theories not based on broad and deep aesthetic experience are worthless. Only those for whom art is a constant source of passionate emotion can possess the data from which profitable theories may be deduced; but to deduce profitable theories even from accurate data involves a certain amount of brain-work, and, unfortunately, robust intellects and delicate sensibilities are not inseparable. As often as not, the hardest thinkers have had no aesthetic experience whatever” (7). They talk of experience without thought, yet nowadays, we all know that everything—even matters of the “heart,” are actually processed by the mind. Such processing of experience from “significant forms” without consideration for content is still a mental and an intellectual practice. Of course the quality and depth of such practice will vary from the halls of the academe to magazines and even to cocktail receptions of the art circles. Which perspective will the flâneur prescribe to? “The existence of art is the concrete proof of what has just been stated abstractly. It is proof that man uses materials and energies of nature with intent to expand his own life, and that he does so in accord with the structure of his organism—brain, sense-organs, and muscular system. Art is the living and concrete proof that man is capable of restoring consciously, and thus on the plane of meaning, the union of sense, need, impulse and action characteristic of the live creature. The intervention of consciousness adds regulation, power of selection, and redisposition. Thus it varies the arts in ways without end. But its intervention also leads in time to the idea of art as a conscious idea—the greatest intellectual achievement in the history of humanity” (25). Though Dewey opened up the art experience to the living creature, much of the art circle still subscribes to the Baudelaire’s concept of the flâneur. 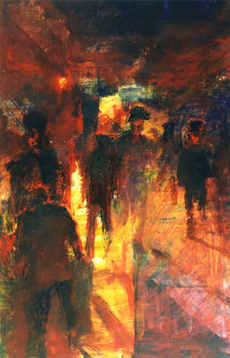 This flâneur would converse and mingle in the art crowd, in search for modernity, as Baudelaire would describe him, “Be very sure that this man, such as I have depicted him—this solitary, gifted with an active imagination, ceaselessly journeying across the great human desert—has an aim loftier than that of a mere flâneur, an aim more general; something other than the fugitive pleasure of circumstance. He is looking for that quality which you must allow me to call ‘modernity’; for I know of no better word to express the idea I have in mind. He makes his business to extract from fashion whatever element it may contain of poetry within history, to distill the eternal from the transitory” (798). So many still subscribe to this concept, forgetting that it is a bourgeois “man” created and conceptualized to appreciate modern art in its “art for art’s sake” realm. To experience and appreciate art, does one really have to subscribe to the demands of the “modern”, does one have to be a flâneur and kiss one another’s cheek in the formation of an art discourse? This concept would shock the flâneur and might question the very foundation of his modernity. Perhaps, it is true that the art circles have not escaped from the modern trappings. They do not realize that this new modernism is actually old, that when they are trying to be avant-garde, they are actually moving backwards and that when they are trying to be flâneurs, they are trying to be bourgeois male of many decades past. Jürgen Habermas, in his Structural Transformation of the Public Sphere states that, “The bourgeois avant-garde of the educated middle class learned the art of critical-rational public debate through its contact with the “elegant world.” This courtly-noble society, to the extent that modern state apparatus became independent from the monarch’s personal sphere, naturally separated itself, in turn, more and more from the court and became its counterpoise in the town. The “town” was the life center of civil society not only economically; in cultural-political contrast to the court, it designated especially an early public sphere in the world of letters whose institutions were the coffee houses, the salons, and the Tischgesellschaften (table societies)” (1747). The more today’s artists, curators, gallery workers and collectors insist upon avant-garde(ness) and modernism, they are not moving forward, they are not even staying still, they are moving backwards, further and further back into art history. Going back to the flâneur, himself an imagination of decades past, as early as Edgar Allan Poe’s The Man of the Crowd, and even Jean de la Bruyère’s The Characters, is neither a new concept nor a unique one. The perspective of a bourgeois middle-class man should be let go of the art world, more importantly, they should let go of the false belief that this is of their own creation in the contemporary world. Modernism is old, so is the avant-garde, so it is about time that the art world should stop trying to be flâneurs. 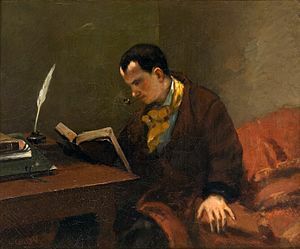 They cannot live as the flâneur lived, nor should they try to, “In the window of a coffee-house there sits a convalescent, pleasurably absorbed in gazing at the crowd, and mingling, through the medium of thought, in the turmoil of thought that surrounds him” (Baudelaire 794). Though experience, pleasure and modernism have a place in the art world, it shouldn’t be the central concepts that drives it. For one thing, we are not all men. Independent bourgeois hardly ever exists anymore as most of us have to work for a living as well. We are no longer concerned with “art for art’s sake,” instead, we are engaging in an art discourse. READ. Soft lighting, generic jazz music, cheap wine, flowing beer, canapés, dimsum, finger foods and pretensions—before falling into this trap, READ. We should stop being flâneurs looking at “art for art’s sake.” Instead, read, study and understand before spouting avant-garde and going backwards, falling into the trap of modernism and Tischgesellschaften. After all, it’s the kitsch that had more success in the long run. It’s the popular image that we live in today. It’s the iconic effigies that are burned in rallies and assemblies. It’s how we got our democracy back. We should live in the present. It’s about time that the art circle grows up and moves on. Before wine sipping and beer guzzling on show openings, opening a chapter or two of theoretical books cannot hurt; after all, it’s the terminologies that they are so fond of using. Though the trappings of modernism are not easy to escape from, we should at least start to. We should accept that we are not, nor we will ever be flâneurs. We don’t have Tischgesellschaften. We have a lot of discourse available to us, we should start discussing topic relevant to the contemporary world that would develop, not hinder art development and maturity. Baudelaire, Charles. “The Painter of Modern Life.” Leitch, Vincent. Norton Anthology of Theory and Criticism. New York: W. W. Norton, 2001. 792-802. Bell, Clive. Art. New York: Frederick Stokes, 1917. Dewey, John. Art as Experience. New York: Penguin Books, 1934. Greenberg, Clement. “Avant-Garde and Kitsch.” Partisan Review (1939). Habermas, Jurgen. “Structural Transformation of the Public Sphere.” Leitch, Vincent. Norton Anthology of Theory and Criticism. New York: W.W. Norton, 2001. 1745-1758. Russell, Bertrand. History of Western Philosophy. New York: Simon and Schuster, 1972. This entry was posted on July 28, 2011 by Portia Placino in Art Theory and Aesthetics, Art Writing and tagged aesthetics, art, Art world, Charles Baudelaire, Clement Greenberg, Clive Bell, Flâneur, kitsch, Modern art, Modernism, Modernity, Renaissance, Wassily Kandinsky.